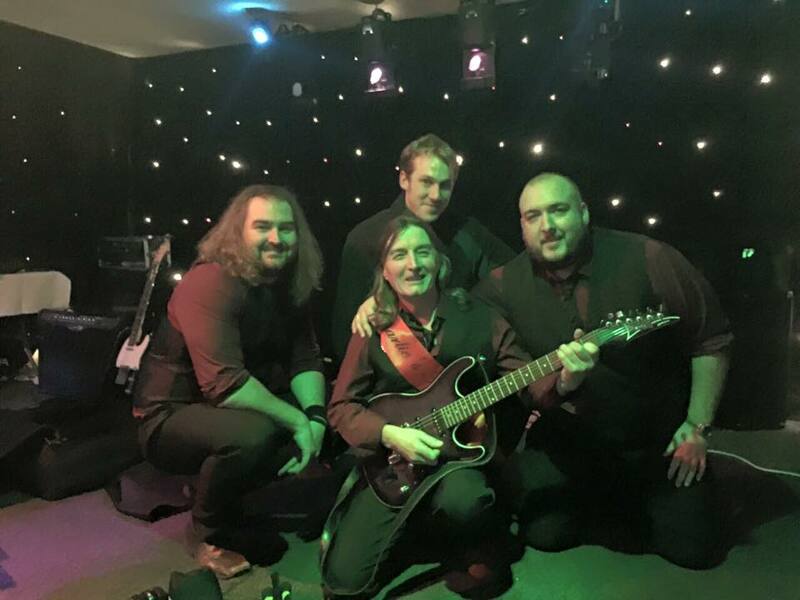 HoldTheLine are a 4 piece band, specialising in weddings and functions. In early 2009, Father and son, Charlie and Phil (Beno) Benson were jamming with close friend Nick Quinn when they were asked to play at a 50th birthday, in which they accepted. At first they thought it would be some sort of house party, but infact it was to be held at a venue in Leigh. This meant buying some speakers and a PA system. The gig went down a storm and the lads took another gig on from this. In December 2009, Ste Crook was invited to sing with the band and from then on the band became a 4 piece. Nick, Beno and Ste had been lifelong friends, in fact Beno and Ste shared the same christening font back in 1986! The bond was already there. The band booked their first public gig for February 2010 at 'The Botanical Gardens, Atherton'. They had been practising new songs for this and really wanted to impress. The Botanical Gardens was full of friends and family all waiting in anticipation, not knowing what to expect from HoldTheLine. Yet Again, the lads went down a storm, and word soon spread about this new band. Offers from other venues in the area started to pop up, but the lads had something else in mind. One weekday evening, whilst jamming, drinking whiskey and watching Shameless, the HoldTheLine lads decided it would be a great idea to travel through Europe and set up for the summer in Corfu. By the End of March it was booked, and in true rock and roll fashion, bought a van, their trusty mascot Jess, the Toyota Estima and in April waved their family goodbye. Making there way through France, Switzerland, Italy, busking and learning new songs, they eventually arrived via ferry in Corfu, excited, but with no idea what lay in front of them. This is just a little bit of what they got up to!.. After local auditions, they were signed up playing 7 days per week in waterfront bars, cafes and earned a contract playing for Thompson's holidays in front of large audiences. Highlights included being official 'wetters' for the weekly wet t shirt competition and meeting some amazing people along the way but at the end of summer it was time for HoldTheLine to return to England. The excellent John Gilbert was the start of the next level for HoldTheLine. The Venue booked the lads for every bank holiday Sunday and various other themed events throughout the year. These nights proved very popular and were often full to capacity before the band even started!They did Manchester themed nights, Schools out disco nights, Halloween 'Rocky Horror' Themes, as well as New Years Eve and Christmas Eve/Boxing day.In attendance were people from 18 years old to 80 years old, Soap stars and musicians, but more importantly for HoldTheLine was the young couples that were searching for the perfect entertainment for their weddings. They were taking multiple bookings for weddings after each gig at The Gilbert, and each of them weddings lead to more weddings and more opportunities for the HoldTheLine lads. They were becoming very well known in their local area and started taking bookings up to 18 months in advance. HoldTheLine were soon signed up to Greene King venues around the North West including Cheadle, Chorlton, Didsbury and the City centre. The band diversified as a 2, 3 and 4 piece band, which kickstarted their acoustic package. Smaller venues or those with noise restraints requested acoustic sessions. This became very popular and was a great way to change up some of the songs they had learned as well as throw in new songs and expand their repertoire of songs and styles. The lads were learning songs fast and had a setlist of around 200 songs to chose from. Due to the amount of music they could play, they ended up securing monthly bookings as an acoustic act at venues through the week, and then would play full band at the weekends. The acoustic gigs tended to be a bit more laid back, casual dress and light hearted. Ste and Beno would turn up without a setlist, read the crowd, and play what people wanted to hear, this included one or two of their own songs. HoldTheLine are a live band through and through. Playing acoustically pushed them to polish their harmonies taking them to the next level where intimate vocal sessions, cocktail hours and personal or private performances became a speciality alongside the big stage sound. HoldTheLine believe passionately in the work of local and national charities and have helped to raise thousands of pounds together with their loyal families and supporters! but it was mostly down to their family and supporters putting their hands in their pockets and donating that this could be achieved. As well as the local venues, HoldTheLine headlined a festival for 2 years at The Croft Young Farmers, which was a massive experience. Having sound engineers and an outside PA, and playing outdoors was just something else. Other events included beer festivals, Award ceremonies and sporting events, and of course weddings and corporate events. The weddings we're coming in thick and fast, and they became the favourite gigs for HoldTheLine. There is just something about a wedding that gave them a sense of accomplishment. Making memories for a couple to last a lifetime. Plus the fact that everybody at a wedding have come to party. As well as weddings, The lads were being approached by companies to play at their Christmas parties. As a band they were always looking for new experiences. They contacted Holiday parks, Cabaret clubs around the country, and other large hotels and venues. Unfortunately, unless they had agency backing (which is something the band has never wanted to do), or had been on some sort of talent TV show, the entertainment managers were not interested. This didn't stop the lads and eventually, through word of mouth, HoldTheLine were contacted by Cedric Terry - The owner of Rendezvous 1. This club was very well known and had featured acts such as Hernams Hermits and Bernard Manning in their early days. It was a cabaret club so customers paid up to forty pounds for a 5 course meal, live music and a DJ to finish the evening. The owner wanted to bring the live music feel back into the club instead of backing tracks and Tributes. The lads had a 1 off trial gig, in which they helped to fill the place with their supporters and families and the night went down a storm. The Rendezvous immediately booked them for a Christmas run, and booked 13 dates for the following year, including New Years Eve, the biggest night of the year. They became the resident band for the Rendezvous, playing full band as well as acoustic, and even DJing. This was one of the best venues the lads had played so far, and they loved the atmosphere. Hen Parties, Works Christmas parties, anniversaries, it was like playing 10 celebrations all in 1 go, and they had the range of music to play a different set each time and please everyone. Although playing at The Rendezvous was an amazing time for the band, the real fun and sense of really making a difference for someone still lay with the weddings. So after one final New Years Eve blowout to see in 2016, the lads said goodbye to The Rendezvous. ​Wondering whether they had done the right thing really did not last long, as before the guys knew it, 2016 was scheduled to be the busiest year yet! It was also the year that Beno, Ste, and Charlie decided to become full time musicians. They offered bigger packages adding cocktail receptions, which started to become very popular, and this meant that they were doing full days at the weddings, performing in the daytime as an acoustic act, as well as at the evening full band. To date, the lads have sang Blue Moon to Ricky Hatton, they have played for Ryan Giggs' Mum, played infront of various Manchester City players, Invited Max George from 'The Wanted' up on stage to sing with them. They have sang to 'Steve McDonald' from Coronation Street, and 'Kelly McGuire' from the hit show 'Shameless'. HoldTheLine have some other ideas up their sleeve for 2017 to expand and make HoldTheLine a brand. They are expanding their song list weekly, and are always looking for new opportunities. Watch This Space!